In what had been billed as a tight race in the U.S. Senate contest in Missouri Tuesday ended up as a sizable victory for Republican challenger Josh Hawley. At his victory speech in Springfield, Hawley said he received a call from both his opponent, Democratic Senator Claire McCaskill who conceded the contest, and President Donald Trump. The president held a late-night rally Monday in southeast Missouri’s Cape Girardeau that may have provided the boost Hawley needed to stretch his margin of victory to 6 percentage points. In 2016, incumbent Republican Senator Roy Blunt beat Democratic challenger Jason Kander by a comparatively slim margin of 3% in an election in which Donald Trump carried the state by 19 points. In his 51%-to-45% victory over McCaskill, Hawley far outperformed recent polling. Going into Tuesday’s election the Real Clear Politics average of polls gave Hawley a razor-thin 0.6% lead. Three late polls were released Monday morning. One, NBC/Marist favored McCaskill by 3% while another, Emerson, gave a 3% edge to Hawley. A third from HarrisX had them in a tie. 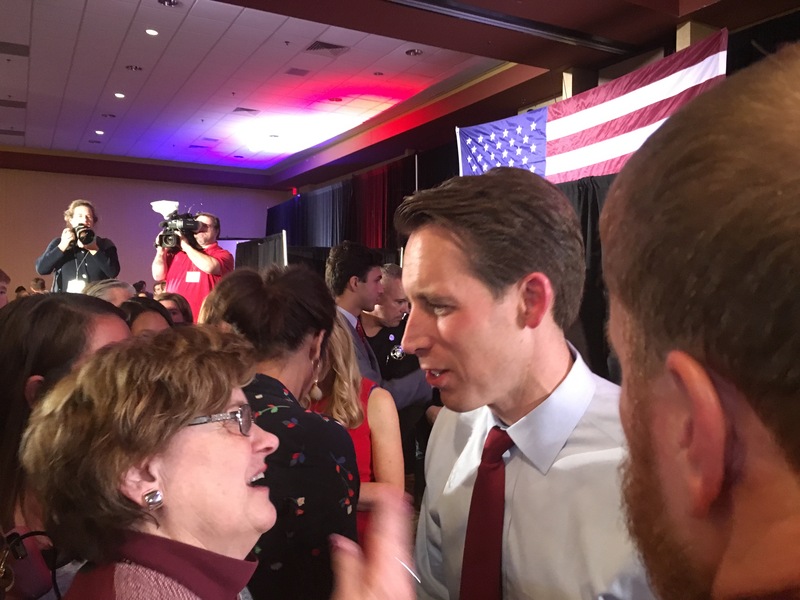 Hawley had tethered himself to President Trump’s agenda early on in the election cycle and embraced a hard stance similar to the President’s on immigration and undocumented migrants. On the stump, Hawley has criticized McCaskill for supporting a bill all Senate Democrats have endorsed that would prohibit children from being separated from migrant parents within 100 miles of the U.S. border, calling it “lawlessness”. The strategy of aligning closely with the President’s harsh rhetoric on immigration had shown through polling to be a liability in suburban congressional districts but was thought to be helpful for GOP Senate candidates running in rural states won by Trump such as Missouri. With McCaskill’s exit from the chamber in January, Blunt will become Missouri’s senior Senator. McCaskill, in the last weeks of the campaign, lurched to the right, which failed to boost her standing in conservative rural areas. One of her radio ads ridiculed progressive and activist colleagues in her own party as “crazy Democrats” while she also openly embraced President Trump’s plan to block a caravan of refugees fleeing violence in Central American countries from entering the U.S. “Stop them at the border,” McCaskill proclaimed during an interview on the conservative, pro-Trump cable outlet on FOX News. The outside money expended in the Missouri Senate race as of several days ago was roughly $77 million, according to the Center for Responsive Politics. The biggest portion of that total, close to $40 million, was spent in opposition to McCaskill. Only the Florida Senate contest outstripped the Missouri race between McCaskill and Hawley in outside money spent across the country. Nearly $90 Million in outside spending had gone into Florida, a much more populous state with more media markets than Missouri, as of the last few days.